Gensuite earned praise for offering a very robust and capable technical platform, backed by excellent data capture and data security capabilities, and a broad range of other features for various allied functions. Gensuite garnered the second highest score in both audit and safety management. The company was cited for its two-fold approach to audit management, and was ranked highly in all 11 subcategories of safety management, including confined space analysis, fall protection and lockout/tagout. Gensuite also scored well in chemicals management, achieving the second highest score among all vendors surveyed, and hazardous waste management, an area in which many other vendors lacked. Gensuite was first developed as an internal EH&S application within General Electric, but spun off as Gensuite LLC in 2008. Since then, Gensuite has gained widespread traction, and now counts Stanley Black & Decker, Quest Diagnostics, Penske, Millennium & Copthorne Hotels, U.S. Silica, Comcast, Johnson & Johnson, and all 17 divisions of GE, among others, in its growing client list. The Verdantix report is the only independent benchmark of EH&S software available on the market and provides a detailed analysis of the product offerings from 22 of the most prominent EH&S vendors worldwide. Using its proprietary Verdantix Green Quadrant methodology, the report's findings are derived from a combination of benchmark data from live product demonstrations, responses to a 185-point questionnaire, and interviews with 15 customers across eight industries who have invested or are planning to invest in EH&S software. 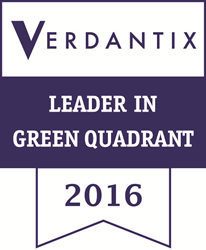 An original copy of the Verdantix report can be downloaded from http://research.verdantix.com/index.cfm/papers/Products.Details/product_id/873/green-quadrant-eh-s-software-2016-global-/-. Registration may be required.